As some of you know, I never got the baking/cooking gene. My sister very much did, and both of my parents are amazing cooks. I however struggle with anything beyond grilled cheese and tacos. Therefore; Ryno is the cook of our family. Another thing you may or may not know about me is that I love holidays. I love to make holidays and birthdays last closer to a week than a day. 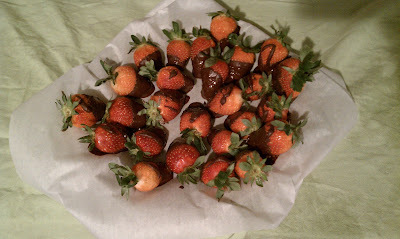 So today, in honor of my week of Valentine's, I made Ryno chocolate covered strawberries. Also, here is what we got each other. 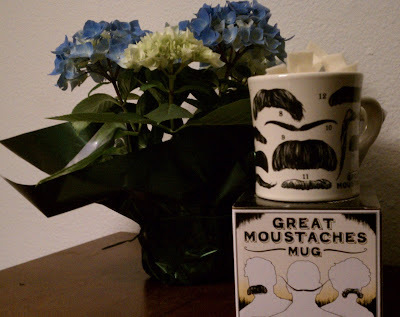 I got him a mustache mug, which you may have seen me talk about on this blog before. Ryno got me a hydrangea plant. Isn't it lovely? I am planning to get a fun little pot for it to grow in.